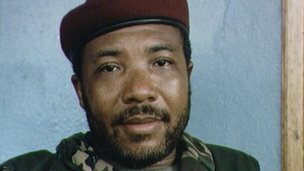 US authorities say former Liberian leader Charles Taylor worked for its intelligence agencies, including the CIA, the Boston Globe reports. The revelation comes in response to a Freedom of Information request by the newspaper. A Globe reporter told the BBC this is the first official confirmation of long-held reports of a relationship between US intelligence and Mr Taylor. Mr Taylor is awaiting a verdict on his trial for alleged war crimes. Rumours of CIA ties were fuelled in July 2009 when Mr Taylor himself told his trial, at the UN-backed Special Court for Sierra Leone in the Hague, that US agents had helped him escape from a maximum security prison in Boston in 1985. The CIA at the time denied such claims as “completely absurd”. But now the Defence Intelligence Agency, the Pentagon’s spy arm, has disclosed that its agents – and those of the CIA – did later use Mr Taylor as an informant, the Globe reports…. Wasn’t this already known, though? He was educated in the U.S. How else could an international war criminal execute so many of his own people with assistance or (blind-eyed assistance) of an organized group?